Microsoft has finally added a Dark Mode to Outlook.com. This, according to the company, has been one of the most requested features for a long time, and Microsoft has finally seen fit to grant Outlook.com users their ultimate wish. An increasing number of websites and apps are offering dark modes these days. Including Windows 10, which has its own Dark Mode How to Auto-Toggle Windows 10 Dark Mode at Night How to Auto-Toggle Windows 10 Dark Mode at Night There are a few settings you can change in Windows 10 to mitigate the impact of a bright screen on your eyes, and one of those settings is Dark Mode. Read More you can set to toggle on and off automatically. And now Microsoft has added a Dark Mode to Outlook.com as well. Outlook.com’s Dark Mode is only available on the new Outlook.com experience (formerly known as the Outlook Beta). It also only supports the default blue theme right now, although Microsoft hopes to make it compatible with the other themes as well. I just don’t see all the fanfare in “dark mode” in Outlook, Mojave, Windows, etc. What’s so great about it? What am I missing? 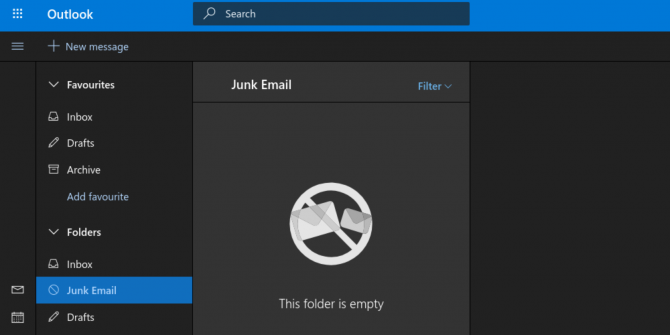 To turn on Dark Mode, click the Gear icon in the top right-hand corner of Outlook.com. This opens the Quick Settings panel, and the option to enable Dark Mode should be near the top. Toggle the slider across, and your display should change from light to dark. The science backing the need for dark modes is undeniable at this point. And with other websites and apps (including YouTube on Android and iOS YouTube Gets a Dark Mode on Android and iOS YouTube Gets a Dark Mode on Android and iOS You can now watch YouTube on your smartphone at night without hurting your eyes. And it's all thanks to YouTube's new dark mode on iOS and Android. Read More ) starting to offer dark modes en masse, Microsoft had little choice but to follow suit. Microsoft’s new Dark Mode for Outlook.com won’t be for everyone. Because dark modes in general aren’t for everyone. I personally don’t like looking at light text on dark backgrounds, even though science tells us this setup puts less strain on our eyes What Is a Blue Light Filter and Which App Works Best? What Is a Blue Light Filter and Which App Works Best? These blue light filter apps for Android will help you get a better night's sleep, even when using your device at night. Read More . Explore more about: Microsoft, Microsoft Outlook, Night Mode. And we call this innovation? I call it a "theme". In "dark mode" you can't tell if a message has been opened or not.